The most common size of a small square bale is 450mm width x 355mm height x 900mm length (18" x 14" x 36") and weight of around 20-35kg depending on the crop. There is also a less common 30" length bale. Mainly produced now for or by the hobby farmer (small acreage) and for horse feed (or other farm animals). Easily stacked and stored in the shed and easy to handle because of size and weight. 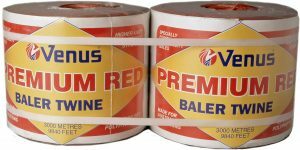 Venus has been supplying a range of small square Polypropylene baler twines since 1984, making them one of the most tried and trusted twines in the field. 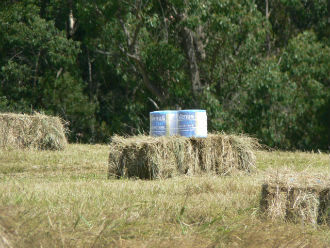 They are suitable for all straw, hay or silage crops. Our original small square twine proven in the field since 1990. Carbon black additive provides the best guarantee for protection against UV degradation for up to 12 months. Knot strength of 69kg and Tensile strength of 122kg. 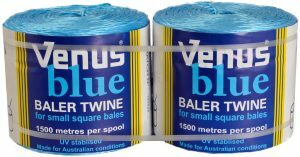 A softer natural fibrillated twine which prevents knot slippage. Higher tensile and knot strength for high density small square bales up to 32kg in weight. Softer twine causes less wear on the knotters of the baler. Knot strength of 74kg and Tensile strength of 130kg. Introduced by request for easier visibility on the bale and in the paddock. Like the Premium Red is softer on the knotters due to the fibrillation. Specs are the same as Premium Black. 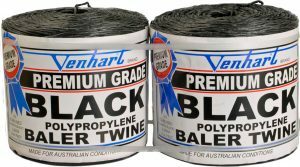 Our strongest small square bale twine with a Knot strength of 88kg and Tensile strength of 145kg. It is made in high visibility blue and suitable for high density bales. Extra length per ball means less down time in the paddock. 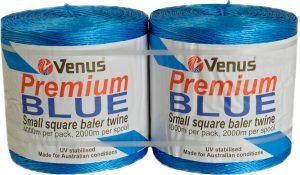 A strong natural fibre twine treated with insect and rodent repellant. Popular for it’s environmental advantages and preferred by sheep / wool farmers over Polypropylene twines when feeding out. Also rot and mildew resistant which helps in some storage conditions.